The New Downtown continues to attract attention and become one of the “it” spots in the city. The most recent new development to debut in the neighborhood is 25 Park Row, situated adjacent to City Hall Park. The unique location puts it right on the cusp with easy access to the Financial District, Tribeca, and SoHo. 25 Park Row is joined by famous neighbors on multiple sides including The Beekman, The Woolworth Tower, and 30 Park Place. The 50-story art deco-inspired tower will be comprised of 110 residences with views of City Hall Park. The building is expected to achieve LEED status. 25 Park Row is designed by Cookfox Architects with architectural details throughout the building inclusive of loggias, Juliet balconies, and large, casement-style windows. Residences features classic details yet done in a modern way that brings the perfect sensibility to what living downtown today is all about. Residences feature finishes such as wide-plank European white oak flooring. Kitchens are done with white lacquer millwork cabinetry, cantilevered walnut islands, and are outfitted with a Miele appliance package. Master Baths are modern and luxurious, with calacatta gold marble countertops, flooring, and wainscotting with European white oak vanities. Penthouse residence master baths feature freestanding Kallista tubs. The building will have a suite of amenities dubbed The Park Row Club which have been curated and designed by Studio Mellone. It will offer a variety of leisure spaces that overlook City Hall Park including a living room, library with fireplace, private dining room, and billiards. A Garden and Dining Terrace provide outdoor space which will include a lounge area with space for grilling. A 65-foot swimming pool, spa treatment rooms, park-facing gym, and private yoga studio round out the curated amenity offering. Currently availability starts with 1 Bed // 1.5 Bath offered at $1,695,000 with CC: $1,105/MO and RE Taxes: $1,105/MO. Interested in 25 Park Row and Experiencing the New Downtown? Contact Us today! Situated at the gateway to Tribeca by City Hall Park, the Woolworth Tower has been an icon of the downtown skyline since its completion in 1913. The building was originally commissioned by retail titan Frank Woolworth, and has had a storied history. French architect Thierry Despont, known for his restoration skills, is transforming the top 30 floors into a boutique collection of 33 luxury residences. Additionally, the top of the tower will feature a crown jewel of all of the city – a 7 story penthouse that is rumored to be asking $100M+. In his transformation, Despont is paying great attention to detail and homage to the building's landmark status and heritage as well as its Beaux-Arts design, visible from the small "W" detailing in the kitchen to the intricate residential lobby entrance. The homes feature gracious layouts with high ceilings as well as features such as eat-in kitchens and luxurious master baths sheathed in Calacatta Prima marble. Views from the residences of the skyline and beautiful terra cotta ornamentation are stunning! The building also offers an impressive collection of amenities, starting with the beautifully restored lobby with coffered ceilings on 2 Park Place. Amenity offerings include a 50-foot lap pool, fitness center with sweeping North and East views, wine storage, wine-tasting room, and a private residents’ lounge. Current availability starts with a 1 bed/1.5 bath asking $4.575M. 30 Park Place, the first private residences by the Four Seasons in New York, has had an overwhelmingly positive reception since its launch. The building is positioned conveniently in the heart of downtown Manhattan, moments from The Oculus, TriBeCa, and SoHo. 30 Park Place is a Silverstein Property designed by Robert A.M. Stern architects and is currently the tallest residential tower in lower Manhattan standing at 937 feet. The building is home to 157 luxury residences. Residences feature a warm feel, a recognizable feature of many of Stern’s homes. Because residences start on high floors, many offer multiple exposures with wonderful views of downtown. Finishes include solid white oak cabinetry, Colorado White Marble, and Bianco Dolomite marble in master baths. 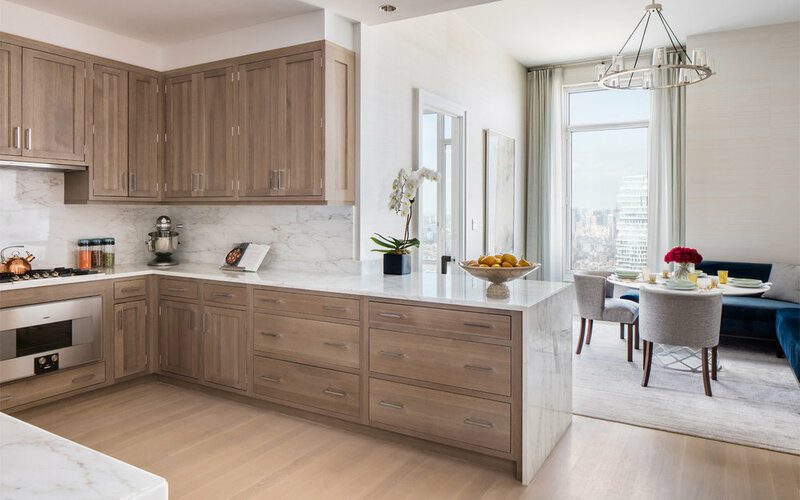 Because this is the Four Seasons Private Residences, residents of 30 Park Place enjoy a suite of amenities and offerings that offer an unparalleled luxury living experience. Residents can enjoy access to hotel amenities such as the indoor lap pool, in-residence dining from Wolfgang Puck's CUT, and car service. It is also rumored that big names are calling the building home including Yolanda Hadid. Developer Sharif El-Gama has assembled a world class team to establish 45 Park Place as an internationally recognized addition to lower Manhattan’s skyline. Pierre Lissoni, Michel Abboud, and Jean Nouvel have partnered to each lend their unique perspective to various elements of this new modern masterpiece. 45 Park Place will be home to an exclusive collection of 50 homes with the base of the tower dedicated to loft-like homes while upper floors have full-floor residences with stunning 360-degree city views. 2 duplex penthouses will be the crown of the building that will feature custom sculptural staircases, an iconic touch from Lissoni. Luxurious finishes, selected by Lissoni, can be found throughout the residences. These include things like integrated Gaggeneau appliances, full height lacquered cabinetry, and Italian limestone. Kitchens are designed by Italian custom manufacturer, Boffi, while master baths and powder rooms feature custom pieces from MOMA Design. Amenities have also been designed and curated by Pierre Lissoni and encompass 3 levels. Amenities will include a pool, spa, gym, yoga studio, as well as a residents’ lounge and children’s playspace. Current availability starting with 2 Bed/2.5 bath offered at $3,800,000. Interested in experiencing the Best of Park Place? Contact us to arrange your property tours. Heritage – something that defines iconic brands around the world. Whether in fashion, automotive, beauty, or architecture, heritage is common among the best brands and the most well-known brands. Volez Voguez Voyagez by Louis Vuitton is an exhibition that explores that heritage of the Louis Vuitton brand, sharing their unique story and the impact that have made across centuries in travel and luxury. The exhibition has completely transformed the old American Stock Exchange building on Trinity Place into a complete world of Louis Vuitton. Visitors step into the story of Vuitton from the beginning as they are told the story of a 14-year-old Louis Vuitton who left Anchay on the eastern border of France in 1835 to head to Paris by foot, reaching the city of lights 2 years later. From there, visitors walk through a visual representation of milestones and iconic pieces from the maison until the modern era. From some of the first trunks created in 1892 to pieces owned by famous stars and one-of-kind collaboration pieces, the exhibit has unique and rare pieces that you will not be able to view anywhere else. The end of the exhibition features artisan showcasing how certain aspects of the bags are made where visitors can also feel the various types of leathers. There is also a small boutique at the end featuring a variety of coffee table books, small leather goods, and the newest range of perfumes. In the Manhattan Residential Real Estate market, the buzz is all about downtown. It seems like almost everyone wants to be downtown, close to some of the best cultural, shopping, and dining options, situated in the most desired neighborhoods of the borough. The economic expansion, and quite frankly, revitalization of lower Manhattan since 9/11 is astounding, and has had an enormous impact on the city as a whole, especially in recent years with hallmark projects finally coming to fruition. Today, lower Manhattan continues to thrive with brand new destinations for world-class shopping, dining, and, of course, living. The Financial District was one of the hardest hit by 9/11, but also has seen the greatest revival in the post 9/11 era. The Financial District attracts a mix of residents from Wall Street professionals that work close by, to students of city universities and people that love the convenience of the neighborhood. The neighborhood has virtually every subway line to connect you to any area of the city and is positioned for easy access to both the West Side Highway and FDR Drive as well as Holland and Brooklyn-Battery tunnels for those with cars. Not only is FiDi convenient from a transportation standpoint, it is also located near some of the best and hottest neighborhoods of the city including TriBeCa, SoHo, and the Seaport District. TriBeCa is seeing new development including the popular 70 Vestry and 443 Greenwich Street while the Seaport District is seeing a revitalization spearheaded by the Howard Hughes Corporation’s development of the area, bringing the arrival of notable venues such as iPic Luxury Theaters and a Jean-Georges food hall. The area is also home to the much talked-about 1 Seaport development. The Financial District, however, has been at the heart of the revitalized downtown and the center of what many are calling the “New Downtown.” The arrival of The Oculus, Brookfield Place, and the continued completion of the World Trade Center site are attracting people to the neighborhood. Even large corporations such as Conde Nast and Spotify are calling the neighborhood home. Additionally, this week restauranteur Danny Meyer announced that he will be launching a $30M restaurant, bar, and event space atop 28 Liberty Place. While the area is certainly more crowded during business hours with working people, the area has a neighborhood feel. Financial District has great public schools, and is close to many parks. You will find runners out in Battery Park and Hudson River Park year-round, and people enjoying the sun and biking in warmer months. Additionally, the Seaport is only moments away which offers many spaces to relax outdoors, shop, and dine. The Financial District offers a mix of new construction as well as conversions. Additionally, the neighborhood has both rental buildings as well as condos and co-ops. Notable new development occurring in the area includes Macklowe’s conversion of 1 Wall Street which has already signed Whole Foods as a tenant, the ongoing conversion of 101 Wall Street to luxury condos, and the recently constructed 50 West. Standing over 780 feet tall, the glass tower located at 50 West Street has changed the lower Manhattan skyline. The 64-story structure is visible in all downtown skyline photography and is visible driving into the city from New Jersey or coming in on the ferry. The tower, designed by acclaimed architect Helmut Jahn, features unique floor-to-ceiling, curved glass and offers spectacular views of the harbor and New York City skyline. Residences range in size from 1 to 5 bedrooms and feature interiors that have been elegantly designed by Thomas Juul Hansen. Throughout the building there is a unique collection of duplex units as well as units offering stunning double-height spaces. 50 West offers residences an array of amenities spread across 4 dedicated floors. Amenities include an expansive fitness center, Water Club, unique children’s space, office space available for purchase, and an observatory located on the 64th floor. The views from the observatory are jaw dropping to say the least! 50 West is ready for immediate occupancy. 50 West Street, 20B: The Victoria Shtainer Team is pleased to offer one of the unique double-height residences available for rent. Be the first to live in the stunning new building and experience the New Downtown in luxury with residence 20B, available immediately. Interested in living at 50 West Street or Experiencing the New Downtown? Simply fill out the form below to get in touch!